Micro-nymphs on hook size 16-22 need of course to be simple, and the one presented here combines in a simple way attractive colours for especially grayling. Most times I fish this nymph tied on a very thin fluorocarbon 0,10-0,12mm, tippet material and this again tied from the hook bend of a deer-hair dry fly. 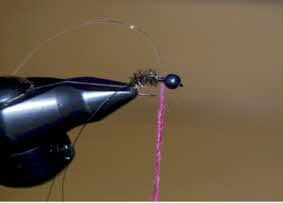 My favourite pattern of dry fly is a variant of the Elk Hair Caddis. 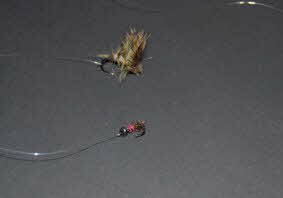 There are numerous ways to tie this fly to imitate caddis, mayflies, stoneflies and buzzers. Size, colour, with or without palmered body-hackle, heaviness of dressing and position/tilting of wing, are adjusted to create very good imitations of different stages of the insects mentioned above. 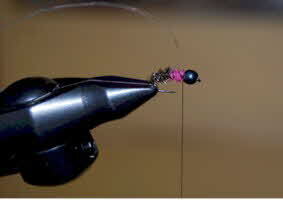 Impregnated with a good floatant, I use down to size 14 for the dry, and this fly easily carries a micro-nymph size 18-22. 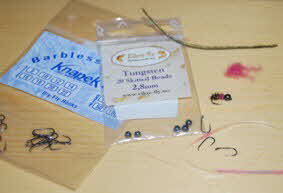 I favour Knapek barbless hooks; I find the long point having very good hooking ability. 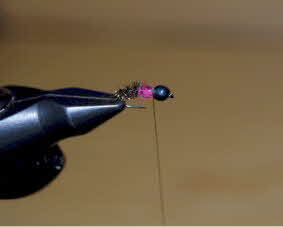 Tungsten beads slotted 2,8mm, pheasant feather, pink wool dubbing and a pre-cut stripe of pearl sheet, are things you need. After the pheasant, tie in the strip of pearl. Finish the nymph with the whip-finishing knot and a drop of varnish. Tied with thin tippet material, 60-90cm from the hook bend of the dry, this setup gives me a lot of fun especially close to bank fishing for grayling in the autumn. In October and November, big grayling can often be found very close to the bank in 0,5-1m deep water. Here they feed on small stoneflies and buzzers hatching in only a couple of degrees of air temperature on sunny days. 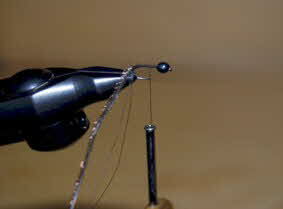 To cast this setup with the impregnated size 14 Elk Hair variant and a size 18-20 micro-nymph. 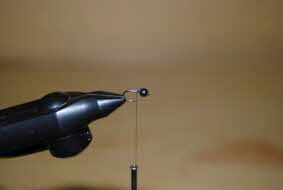 This is almost as easy and smooth as casting with only a dry. I use Elk Hair variants imitating the insects hatching. Where I live I often find small black stoneflies at this time of year and my variant is then sparsely tied of black deer hair. Frequently, the grayling will take my dry “strike-indicator”, but summarized in a season, 60-70 % of my grayling are caught on the nymph. 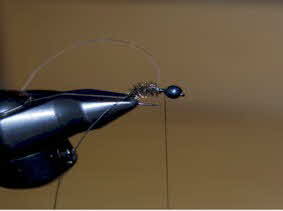 For deeper water and also with the need to quickly adjusting the depth, I still frequently use the micro-nymph with very thin and long fluorocarbon leader. 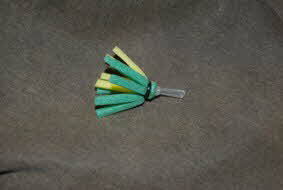 But now I use the strike-indicator presented elsewhere at GFF.